Considering the association of astrological Jupiter with the concept of freedom, comparisons between the 1963 speech delivered from the steps of the Lincoln Memorial by Dr. Martin Luther King Jr and the speech's 50th anniversary this Wednesday as marked by President Barack Obama with a speech of his own, may be worth denoting here. Below is a synastry grid between the two dates/speeches based on their horoscopes set for 3:00 pm edt, the moment of MLK's admonishment to "Let freedom ring" was given. On Wednesday, Dr. King's glorious call will be remembered by the ringing of bells across the globe in participating locations at 3:00 pm in the applicable time zones and this may bring to mind many comparisons--and great differences--between Freedom 1963 and Freedom 2013. Or should I say, Restriction of Freedom 2013? Note: On Tuesday August 27th, expansive Jupiter exactly conjoins US natal Sun (the leader; the president) as noted here (horoscope shown) and by the 50th anniversary of Rev. Martin Luther King's "I Have a Dream" speech on Wednesday, Jupiter remains at the 13th degree of Cancer so the transit is still in progress (click for details) and influencing the president and other US leaders. As you see, the 2013 Sun is naturally conjunct its 1963 position though one degree further along; both speeches are delivered during Mercury Hours (good for speaking and delivery of messages and ideas) with Mercury the Messenger @1Lib30 (conjunct MC and even closer to US natal MC 00Lib53) in 1963, and @9Vir26 in 2013. 1963's Uranus-Pluto midpoint = 2013 Mercury which indicates preoccupations with new ideas and plans, and shows that President Obama may mention the Uranus-Pluto conjunction/s indicators of upheaval, protests, strikes against inequality, and the labor movement which MLK was in process of uniting with the Civil Rights movement of the 1960s. And this People Powered union the global government transnationalists could not allow Rev. King to put into effect--he was 'too popular'. Our current influences in society from the Uranus-Pluto Cardinal Square (2010--2015) time a phase of blockages and obstacles within their broader cycle: progressive disruptor Uranus, the rebel and anarchist, vs ancient Pluto, the powerful exploiters and wealth-hoarders who manipulate events from the seclusion of their ivory towers--and Banking Houses. As in 1963, the 2013 Sun conjoins 1963 Uranus, planet of freedom and independence, a time of group participation and the benefits thereof, plus, a focus on such things as technology, the media, and being noticed for originality or uniqueness. Now with Neptune the planet of dreams, we may notice interesting correlations between 1963 and 2013. 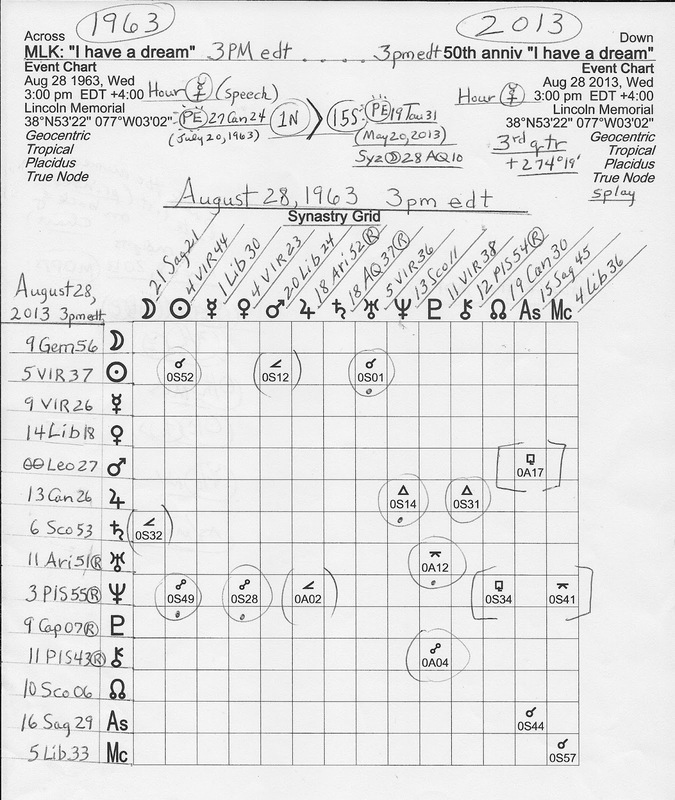 First, however, we may wish to notice that on August 28, 1963, Saturn, the planet of reality, realism, and restriction, squared Neptune (5A25) denoting someone--the dreamer, Neptune--attracting secret enemies. A Saturn-Neptune square may also signify the use of cunning, deceit, and devious methods to attain goals, and involvement in scandal and intrigue. This brings to mind Saturnian FBI Director J. Edgar Hoover who used such methods and tactics against Dr. King who may have resorted to use of deviousness himself (who wouldn't with J. Edgar on their case?) Clearly, since Dr. King knew he was on the government hit list, the Sun-Pluto = Uranus midpoint picture of 1963 shows he was indeed 'carrying out fanatic reforms without regard for oneself', with the power-craving duo of Sun-Pluto denoting, among others things, martyrdom. No, Dr. King did not reach the Promise Land with us nor have we reached it 50 years on with anti-social forces working hard these last decades to regress American society on all levels, including Voting and Civil Rights! Plus, as you know, income inequality in 2013 has only ballooned to crashing proportions. So let's get back to the synastry grid and dreamy Neptune, planet of inspiration and spirituality, but with a potential for deception and fraud. Neptune is the most active planet in this 1963--2013 comparison and in 1963 was posited @13Sco11 where transit Saturn will soon visit. Will this be the grim face of reality? Or, a dream come true? 2013 Neptune opposes 1963 Sun indicating goals and purposes not attained (as noted above), undermining of efforts to reach objectives (bringing martyrdom to American leaders has done that craftily), and eroded effectiveness of leaders. Also, scandalous situations and dishonest people often damage reputations with Neptune opposite Sun. 2013 Neptune opposes 1963 Venus showing confusion and deception in relationships; attempts to resolve difficulties are eroded by mistrust and falsehoods while diplomatic gestures are empty, monetary matters are liable to sink or slide into bankruptcy, and promised cooperation may never materialize--or if it does, it hurts more than helps. 2013 Neptune is also involved in an applying minor aspect (semi-square = 45 degrees) to 1963 Jupiter, planet of freedom (as noted--Jupiterian freedom tends to be within codified laws and traditions while Uranian freedom is a disruptive and rebellious energy which may require revolution to be attained.) The semi-square denotes the use of slight exaggerations and an insidious undermining of plans due in part to unwarranted optimism; fanaticism is masked by idealism--and any combination of the inflationary duo of Jupiter-Neptune often denotes flights of fancy, speculation, waste, fraud, promotion, and/or the grand spirit. 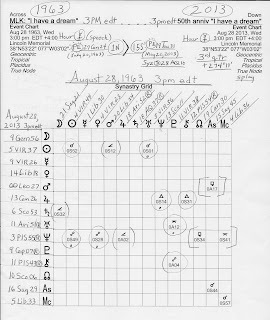 1963 Jupiter Rx @18Ari52 (ruler of both charts) makes no other applying aspects in the 1963 chart which partially describes how the dream of Jupiterian freedom has not been realized as We the People want or had expected. Yet in pioneering Aries, Jupiter wants his freedom! In addition, "I have a dream" (Neptune)--"Let freedom ring" (Jupiter) is supported by 2013 Jupiter trine 1963 Neptune, a period of tricky circumstances and complex legalisms, a need to focus on reality, a potential for much inspiration, and possibly benefiting from 'dumb luck'. 2013 Chiron opposes 1963 Pluto, a condition which echoes the Pluto-Chiron opposition in President Obama's natal chart and describes those who struggle to express archetypal energies into awareness within the collective psyche. Now certainly there are many other factors worth considering in both horoscopes including several planetary patterns and much information may be garnered from additional study of Dr. King's natal chart and that of others. So I hope you'll set up the horoscopes for yourself and let me know if you have any thoughts astrologically and/or politically! Both charts/speeches show Jupiter-ruled Sagittarius rising with Venus-ruled Libra at both Midheavens (The Goal; Aspiration--a dream of balance and fairness...Libra! ), and these Angular cusps echo those of America's natal chart of July 4, 1776 5:10 pm LMT Philadelphia, PA. In 1963, a happy Sagittarian Moon (We the People) was rising in 1st house while in 2013, stealthy Pluto Rx @9Cap07 rises and promises the continuation of secret control and plutocracy, and a potential for events and conditions which are too large or overpowering to handle while We the People (Moon) are expected or required to adjust (inconjunct) to power-craving Pluto's insensitive demands and hidden agenda in 2013.